The 12th of November is a date of incredible emotional opportunities, but also a time when struggles in relationships might lead one into a loop of wrong conversations and cut off contacts. A lot of tenderness is needed in order for those born on this date to find their blessings and feel the gratitude that comes naturally once they accept their role in the world and their own inner truth. The Moon is a bit quenched in this planetary row, having a hard time communicating its emotional wisdom over other people's opinions and personal struggles. To find oneself, those born on November 12th need some alone time and to be absolutely honest with themselves, instead of fulfilling anyone else's expectations. Giving and warm, they have enough light to live a heart filled existence and organize their life in a way that allows all its areas set in place. However, relationships with others pose a threat to their vulnerable inner states and their ego often needs to break and fall in order for them to rise higher than they’ve been before. "A Woman Draws Away Two Dark Curtains Closing the Entrance to a Sacred Pathway"
The strong symbolism here shows exactly what the feminine energy of those born on this date is capable of, presenting a challenge in itself for fear might be blurring their sight and keeping them on the doorway to something grand for a long time. Their ties to the outer world need to be broken so they can step into their inner wonderland and connect from there, in pure light of their tender spirit, where they cannot be hurt. To get to the point of understanding their core of all secrets hidden that give light and emotional clarity, they need strong boundaries and to take only their own responsibility with them, giving others back their dignity by returning theirs. To care for anyone else, they are bound to care for themselves first, for they cannot give what they don’t possess. 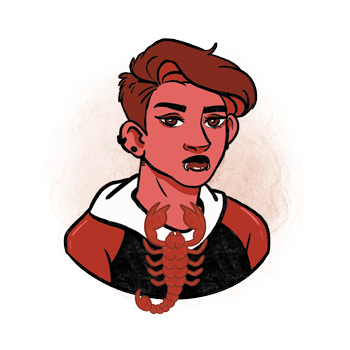 With Mercury being the guiding light in their lives, Scorpios born on November 12th are about to learn how to express themselves without restraint and in freedom of opinions and movement. Tied to one place for too long due to outer authorities, they seek liberation of spirit where they can be their authentic self without questioning, and without allowing intrusions of opinions and limitations of others standing in their path. They need to move, speak and drive, there to give a message to the world they can only discover within. Deeply emotional and fragile, relationships of those born on November 12th start with lots of tenderness and mutual understanding until recognition of shared patterns comes to light. This is when things develop out of control, spinning in the loop of same old issues that their ancestors left to be resolved. Their task in this lifetime isn’t to romantically connect and start a family in a classical sense, but rather to build their inner emotional strength so they can do so with ease and clarity of contact. They need a partner who is supportive and kind, someone modest and grounded enough to not interfere with their personal freedom, and someone to spark the light in their heart so they can give in to the need to protect their sacred bond. For as long as they simply give their energy away before getting fed themselves, they could settle for relationships that aren’t really in tune with their emotional needs. As they embrace their vulnerability, things start to change, and they become ready to connect on deeper levels, prepared to give what it takes for their love to last a lifetime, for as long as the effort goes both ways. A person born on the 12th of November does extremely well in positions of caregiving and care for those who truly need their help. They may become incredible healers, but only when stable on their own two feet and willingly giving what they already healed within. When in tune with the flow of emotion they become wonderful parents, close and intimate partners and friends who understand weaknesses of others. They work well with other people in large teams, often as leaders, for as long as they have enough time to spend in solitude and contemplation. Messages they discover in their own world need to come out, and as they age, they become excellent writers, orators and leaders of movements that set people free. The right choice of healing crystal for someone born on November 12th is dioptase. It is a stone of compassion and forgiveness that allows one to get out of circles and patterns they are stuck in, giving their heart chakra room to let emotions flow and vent in healthy ways. It activates past life memories and might bring on situations that repeat itself so they can be cleansed and worked with from the point of inner support. This crystal helps them move on from all issues that make them feel stuck so they can move forwards with the flow of life. A birthday gift for a Scorpio born on November 12th may be a trinket for their home or something to keep their memories safe, such as a picture album or a creative collage of moments shared. They will appreciate a token of affection however small, for as long as it points out the emotional connection you share with them. If you aren’t that close, you can always choose something golden or symbolic, branded and in tune with the image they wish to present to the world. Take them out to see a play, throw a party, or buy a book that will give specific information on topics of assertiveness and open communication. Deeply sensitive and empathic, they are giving, warm, caring individuals with a big heart. Their strength comes from open discussions, for they are information carriers that need support to give more to the world than they are often confident to. Lack of confidence could manifest in rough decisions, hasty choices and a pushy nature. They could push their heart up the sleeve only to reach the point of status and admiration that can only make them happy when it is in tune with their intimate emotions. In 1929 Grace Kelly was born, an American actress who later became the Princess of Monaco and retired from acting to begin her duties as Princess. Born to an influential family, she pursued her dream of becoming an actress despite her parents’ initial disapproval. In 1980 Ryan Gosling was born, a Canadian actor, musician and producer that gained international recognition for his role in The Notebook. When he was 13, his parents divorced and he lived with his mother and sister, which he said programmed him to "think like a girl". In 1982 Anne Hathaway was born, an American Academy Award winning actress known for her roles in The Devil Wears Prada, Rachel Getting Married, Les Misérables and others. She became fascinated by the stage when she was only six, but her parents didn’t allow her to pursue an acting career at the time. 1555 – Roman Catholicism is re-established in England under Queen Mary I (born on February 18th). 1892 – The first professional American football player on record plays his first game. 1941 – Ski troops of the Soviet Union are launched for the first time against the freezing German forces near Moscow. 1971 – The deadliest tropical cyclone in history falls on the coast of East Pakistan. 1980 – The first images of the rings of Saturn are taken by NASA's Voyager I. 2003 – The world speed record for commercial railway systems is set at 501 kilometers per hour by Shanghai Transrapid. 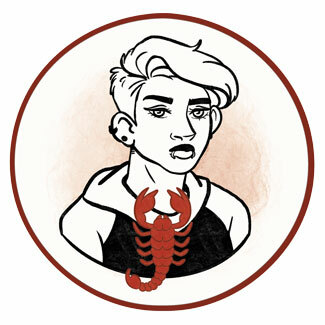 Scorpio - traits, personality, dates, characteristics and astrological sign information. Scorpio man - information and insights on the Scorpio man. Scorpio woman - information and insights on the Scorpio woman. Scorpio history - the history of Scorpio and the stories behind it.